in this post i will show you how to share folder from windows to Linux , you can use smb but in this post i will use it in command line. mount -t cifs //windowsip/sharefolder -o username=administrator,password=administratorpassword /windows-backup. run df -h to make sure the folder has been mounted. Hi Mustafa,Tried the below command a root, but its be flashing with an err “mount error 110 = Connection timed out”I wanna share a folder which is there in windows to RHEL 5mount -t cifs -o username=xxxx,password=xxxx //windowsIP/share /linuxdirmount error 110 = Connection timed outRefer to the mount.cifs(8) manual page (e.g.man mount.cifs)Please help me in getting away from the same. Did you try ping command ? servers should be ping on each other ,otherwise sharing will impossible for you. Yes was able to ping between the servers. But still same err is getting. For username and passwd I'm giving my windows system login credentials which has the admin rights on that. 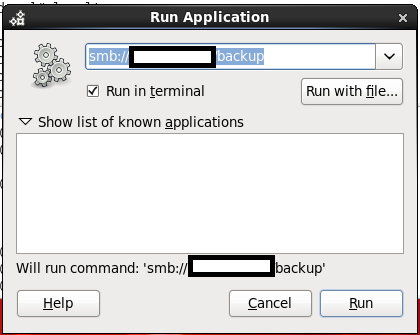 In the linux the samba is not configured, Is it a must to have the samba configured on the RHEL 5 for the above command to work.